Holi is a Hindu festival celebrated in India, Nepal, and other nearby regions, and celebrates the triumph of good over evil. According to legend, the evil Holika’s demon brother king Hiranyakashipu ordered her to burn his own son as punishment for worshipping the lord Vishnu instead of himself. Holika held the king’s son on her lap in the flames, believing she would not be burned. Instead, the son was saved by his devotion, and Holika burned. Today, Holi is celebrated in the spring as a festival of love and color. Revelers play Holi by throwing brightly colored dust on one another, drinking, dancing, and making music. The celebration has gained international popularity, and Holi festivals are held all over the world. Held on the last Wednesday of every August in the Valencian town of Buñol, Spain, La Tomatina is a giant food fight, in which participants throw tomatoes at one another purely for the fun of it. The festival began in 1945 when a fight broke out at a parade, in which residents pelted each other with tomatoes until they were broken up by police. The next year, young residents deliberately recreated the fight. Eventually, the local government decided to make the festival an official event. Today, over 30,000 people visit the town to participate in La Tomatina. Tomatoes are provided, and specific rules are in place. For example, the fight begins when someone manages to bring down a ham which has been placed at the top of a tall, greased pole. In various Latin American countries including Peru and Bolivia, February 2 to the 18th is the festival celebrating the virgin of Candelaria, one of many iterations of the Virgin Mary. The celebration is a colorful mixture of Catholic and pagan. The virgin is also associated with Lake Titicaca, as the birth of the Incan empire. The best place to celebrate the fiesta is in the village of Puno in Peru. Residents parade a statue of the virgin around the streets, dress in traditional costumes, and hold a folkloric dance competition. Alternately known as the Snow Star Festival or Quyllur Rit’i, in the Native American language Quechuan. Officially, the festival began in 1780, when an image of Jesus appeared on a boulder in the Andes mountains after the death of a young shepherd boy. But its roots have held pagan significance for far longer than that. For the Andean people, the pilgrimage deep into the mountains is about the worship of Jesus, the mountain gods, Apus, and the earth mother, Pachamama. At the conclusion of the trek, tents and markets are set up where one can buy food, housewares, and fortunes. People dress in traditional costumes and perform ancient folkloric dances. Gion Matsuri occurs every July in the city of Kyoto, and it is Japan’s most famous festival. It began in ancient times as a way to appease the gods in response to plagues of fire, floods, and earthquakes. The gorgeous floats began as portable shrines to these gods. It became an annual event in the year 970. Today, food stalls are opened, selling traditional Japanese treats. Some locals dress in traditional Japanese clothing, and some private homes open their doors to the public, displaying household heirlooms. Songkran is set to be Thailand’s most popular annual festival, drawing visitors from all over the globe. Songkran is a traditional Buddhist festival celebrating the New Year every spring. Beginning in mid-April, the festival marks the beginning of the dry season, and the hottest time of the year in Thailand. It is known internationally as perhaps the world’s largest, and longest water fight. The throwing of water on one another began as a cleansing ritual, and now has expanded to a days-long, watery celebration. The Boryeong Mud Festival was actually first conceived as a marketing tool for Boryeong cosmetics in 1998. The cosmetics were made from the mud, thought to contain minerals and other properties beneficial to the skin. Today attractions range from a mud pool, mudslide, mud massages, musical performances, a beauty contest, and beauty treatments. Every year on June 21, the streets of Paris come alive with music on every corner. The city-wide free festival was brought about in 1982, by the minister of culture Jack Lang. On this day, musicians both amateur and well-established, from genres as varied as rock and roll to reggae, set up stages in public spaces all over the city to play free concerts. The only rule for the performers is that their time and concerts be free of charge. The festival has been since recreated in cities all over the world. 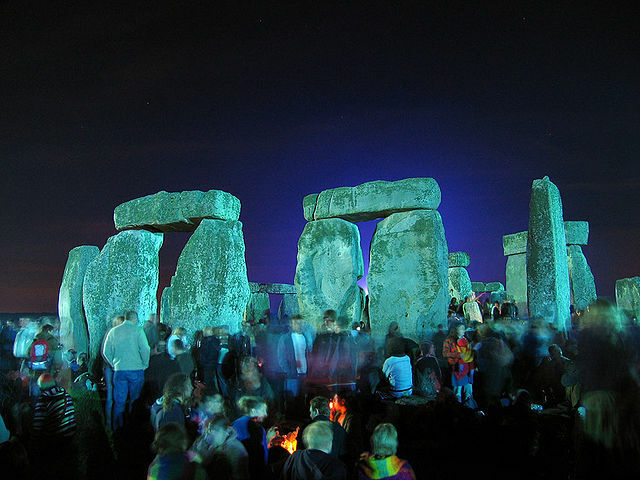 Every year, thousands of people travel to Stonehenge to celebrate the thousands-year-old festival of the Summer Solstice, which marks the longest day of the year. Last year, some 30,000 people gathered to watch the sunrise over the famed neolithic site. Photograph © Andrew Dunn, 21 June 2005.